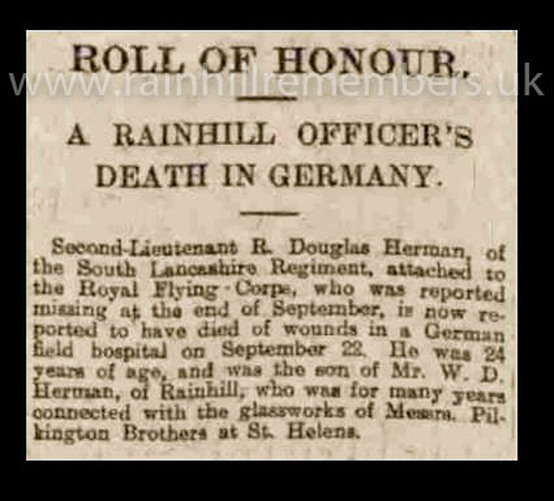 Robert Douglas Herman was born in Prescot and baptised on 23rd July 1893 at Christ Church, Eccleston. He was the son of William Douglas and Alice Maud Herman. William was a Chemist and Manager at Pilkington Sheet Glass Works, St Helens. The 1901 Census records Robert as being an 8 year old pupil at Caldy Grammar School, West Kirby, with his parents living at Holm Lea, View Road, Rainhill. Robert joined the 2nd/5th Battalion of the South Lancashire Regiment in St Helens sometime in 1914 transferring to the 19th Squadron of the Royal Flying Corps at a later date. This was formed on 1st September 1915. He would have trained on a variety of aircraft before being deployed to France in July 1916 flying BE12’s. Second Lieutenant Herman was one of three pilots shot down on 22nd September. He was flying BE12 6561 of 19 Squadron. 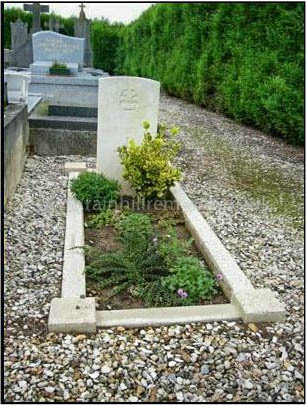 The communal cemetery on the south-east side of Epehy includes the grave of only one British soldier - Lieutenant Robert Herman was buried by Germans in September 1916. There is some dispute as to who actually shot him down. It was either Offizier Stellvertreter L. Reimann of Jasta 2 (the unit where many future aces, including Von Richfen, cut their teeth) or Leutnant R Berthold, the ‘Iron Knight’. Robert died as a prisoner of war in German hands. After the war Berthold met an unusual death when the German communists used the ribbon of his Pour le Merite to strangle him. 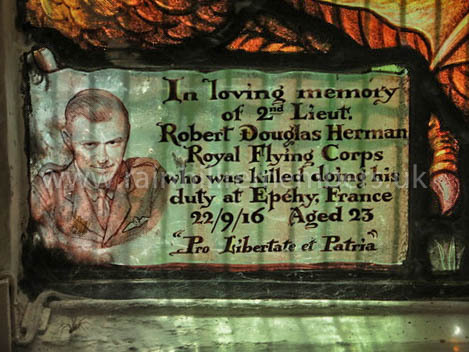 In memory of Robert, his father Douglas had a stained glass window made and dedicated to Robert in Christ Church, Eccleston.